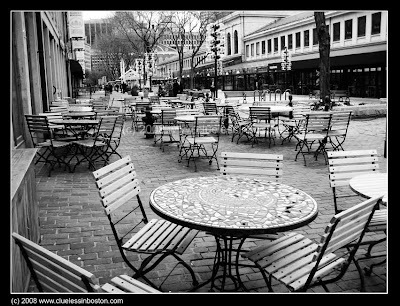 Empty Fanueil Hall cafe on a chilly weekday afternoon. warmer days will come! great photo! Love the photo. Really works in B and W. Adds to the desolation of the day somehow. you captuered the atmosphere pretty well! I live the b&w. I hope you get some warmer days soon :). This looks like France. You had me fooled. It's such a great image, to capture aplce like this so vacant. The b&w is perfect. I agree with Jilly. A classic photo in B&W, indeed enhanced the isolation effect. This photo has such a wonderful atmosphere thanks to the B&W! Very nice!